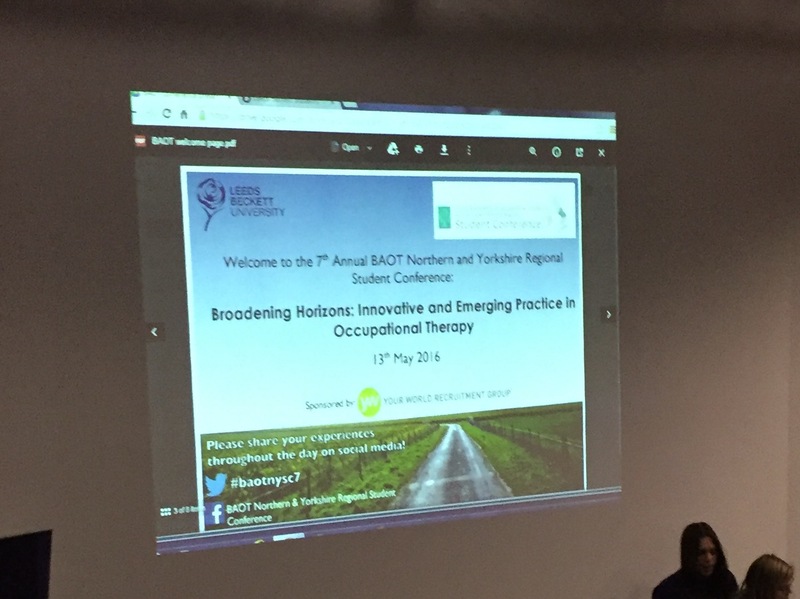 This years BAOT Northern and Yorkshire Student Conference was held on 13th May 2016 at Leeds Beckett University. This was also hand-in day for our MSc dissertation so there was a little bit of forward planning to make sure we had that submitted it the day before so we could attend. This year there was only 3 of us from University of Cumbria which may have been due to the deadline and the fact the 1st year MSc cohort were on placement. Helen Marriott shared with the conference the Five Year Forward view for NHS England focusing on the three key priorities of the workforce, evidence and leadership. As the NHS changes and the challenges become greater, there are opportunities for us as Occupational Therapists to be creative, think outside the box and improve the profession and in turn services we provide for our services users. But for us to do this it is crucial for us to be the 'right person' at the 'right time' and in the 'right place' The means as professionals we need to work collectively as AHPs if we are to have a positive impact. We need to be able to communicate our unique selling points as Occupational Therapists and keep broadening the horizons of those we work with. "Knowledge is acquired, Skills are transferable "
Lynn Mitchell shared her role as an paediatric OT. 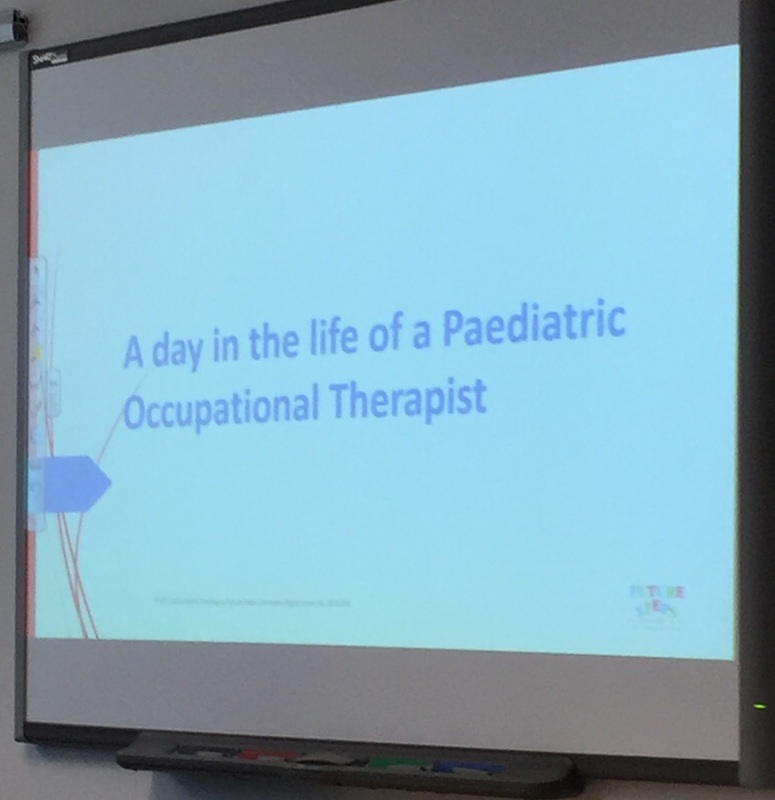 I found this session really interesting as my first placement was based in a Community Paediatric setting so there were some interesting comparisons in the role OTs played. The idea that as a social enterprise, the OTs services are bought in by the schools using the pupil premium for a set period of time allowed them to explore the educational environment and clinic environment as they worked in partnership with the child, school and parents in enabling the students to engage in education. This was particularly evident in the scope of their practice from handwriting interventions and posture control for students to working in with Autism Specialist schools. The schools have an input into the service they want as they are paying for the OT service. but enables the OTs to use a range of skills in working directly with students, educating staff and providing training swell as in an advisory role to the schools. 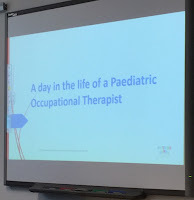 The OTs used GAS light as a goal setting tool, which was similar to my paediatrics placement, and it was interesting to see how the incorporated the different service users (School, parent and child) by having a goal that is important to each of them. I also found the information on assessment tools used useful and it was really interesting to see the range of standardised Ax available for children within an educational setting for OTs to use. 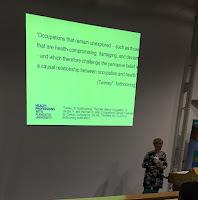 Rebecca Twinley's session was one I had particularly been looking forward to as I had come across her concept of "The Dark Side of Occupation" in a few journals and during a previous #OTalk, so was interested to find out more about the topic. 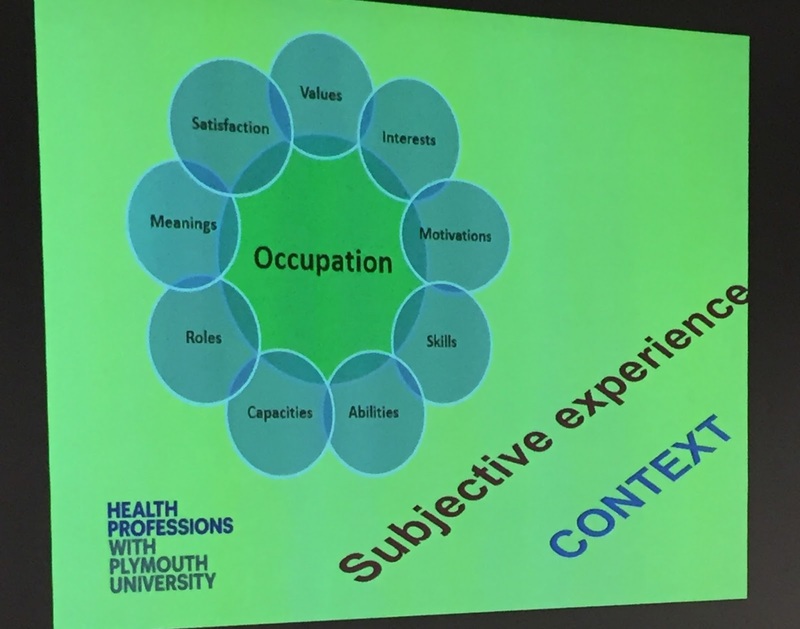 As OTs it s drilled into us that engaging in occupations is positive and beneficial for our well being. But we know not all occupations are good, so why as humanbeings do we continue to find meaning in experiences that are unhealthy, anti social, harmful, disruptive and even criminal? 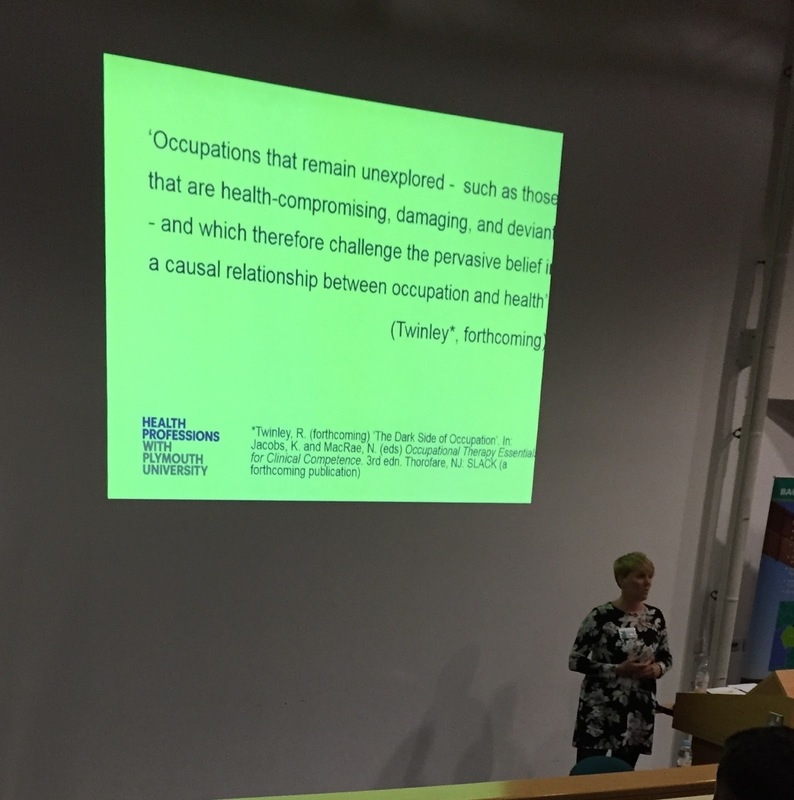 As Occupational Therapists it is crucial that we continue to explore the areas of occupation that are not yet explored (Twinley, 2016), this is because as human beings we are driven and find meaning in activities that give us identity, opportunities to build relationships as part of our social networks and in activities that of course fill our time and routine. And that doesn't mean that the occupations are always positive or beneficial to our health and wellbeing. What motivates a person to undertake dark harmful occupations? We need to be aware that there will always be some level of subjectivity in why someone engages in an occupation and as professionals we need to embrace and seek to understand this whilst being objective in our role as practitioners. We need to challenge assumptions. We work in contemporary settings and with people who are ever changing and evolving and we need to react to this, by continuing to inform and strengthen out practice (Perice, 2004) by adding to the evidence base and engaging with our service users in an appropriate and contextually relevant way. Explore occupations that are not yet explored. Challenge assumptions and understand that engagement in occupations is subjective and individual to each person we work with. As a client centred practitioner we need to utilise the tools we have available to us, to work to understand what influences our clients to engage in their occupations on both sides of the spectrum. 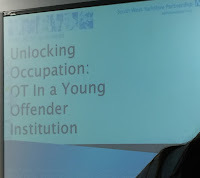 Alex Taylor's session explored the role OTs can play in working with young people within a Young Offenders Institution. It was interesting to learn more about this setting as it is a setting I hadn't overly considered as a potential area of practice but actually is a client group that could benefit greatly from occupational therapy input as they will be suffering from occupational disruption due to their detention within the Young offenders Institution. The MDT approach within the Young Offenders Institutions can enable mental health issues to be addressed through a range of occupational engagement actives such as, cooking, gardening, music, games and living skills. These are delivered through range of one to one interventions and group interventions that enable the young people to develop and engage in a way that suits them. The use of MOHO, CMOP enables client rendered assessment and intervention through Assessing, re-assessing, reviewing, resetting goals or discharging the young people from the OTs caseload. Nick Pollard closed the day by sharing a range of experiences from his career. He challenging us to explore what our borders are as OTs in what we do daily and how we use our skills. What skills do we have for the position we are in and how can we use these to benefit our service users? He also highlighted the importance of recording what we do and how we practice so that we can increase the evidence base for our profession. If it's not written down it can't become evidence. 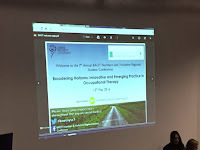 Marriott H. (2016) Five Year NHS Forward View [Opening Plenary] 7th Annual BAOT N&Y Student Conference. Leeds Beckett University. 13th May. Mitchell L. (2016) OT in a Social Enterprise working with Children in Schools [Workshop to BAOT N&Y Student Conference]. [Leeds Beckett University]. 13 May. 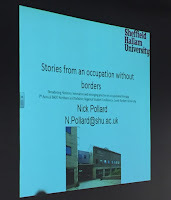 Pollard N. (2016) Stories from an occupation without borders [Closing Plenary] 7th Annual BAOT N&Y Student Conference. Leeds Beckett University. 13th May. 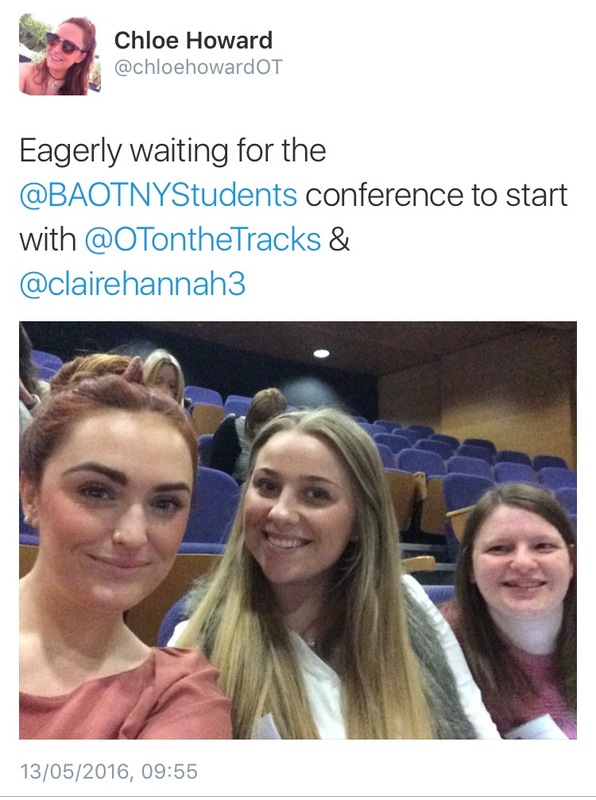 Taylor A, (2016) OT in a Young Offender Institution [Workshop to BAOT N&Y Student Conference]. [Leeds Beckett University]. 13 May. Twinley R, (2016) The Dark Side of Occupation [Workshop to BAOT N&Y Student Conference]. [Leeds Beckett University]. 13 May.